Tom Silverman и англичанина Adrian Sherwood. Электро диско с авангардным ритмом и почти лаунж мелодиями. Что то есть в этом треке от сингла Bonk Combo - Car Jam..
Its weird how I can be looking for the most strange and obscure music and yet it will be more likely than not, my favourite blogs where I will track it down! Case in point here! I had to blink twice when I saw this...an On-U-Sound & Tommy Boy collaboration with Steinski & Double Dee on editing duties in NY and Abaku and Adrian Sherwood doing the initial mixes here in the UK! And YET! I have never heard of this, I presume because it never came out in England...so 26 years later I finally get to listen to it! Its amazing! Also I realise now that this must have been the first Steinski & Double Dee record release as 'The Motorcade Sped On' came out a year later in 1985 on Tommy Boy...you learn something new every day! The record collector in me is going to ask if you have the 'Bonus Beats' that came with the 12 Inch? Are they good beats!?? Thanks so much for this! You are a star! 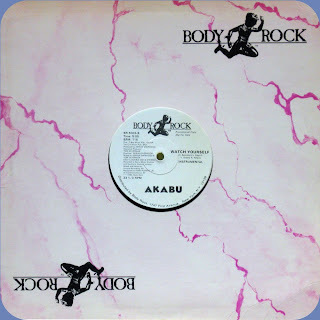 Even when they came out I always called them "Abaku" and not their proper name "Akabu"...even after I bought the 'Pay It All Back' album back in 85 when I first heard their "Akabu's Theme' track and loved it I could never get their name right! I guess after 25 years I will never manage it! Must be some weird neurological glitch!